The Smithsonian American Art Museum is housed in the Historic Patent Office Building in downtown Washington D.C. When I give museum tours, people are always fascinated to learn about the history of the building. Originally constructed in the mid-1800s, the building was conceived as a “temple of invention” and designed to symbolize America’s creative genius and technical superiority. It housed patent examiners as well as the models that were a requirement of the patent application process. These models were displayed in glass cases on three wings of the third floor. The area in the west wing that is now home to the Luce Foundation Center for American Art (the American Art Museum’s visible storage facility) was where the rejected patent models were displayed. On September 24, 1877, there was a major fire in the building that destroyed much of the north and west wings. Fortunately, employees were able to save over 200,000 original patent drawings and some of the models, but all of the rejected models were destroyed. By 1880, the requirement for submitting a model with a patent application was discontinued and the patent office eventually disposed of all the remaining models in its collection. The Smithsonian was given first choice, and the National Museum of American History acquired 6,000 models. Recently, my colleagues over at the American History Museum published an online index of these patents, which provides a fascinating insight into the variety of models that you would have seen had you visited the Patent Office in the nineteenth century. Bear in mind that at its peak, the Patent Office had over 200,000 models, each no larger than one cubic foot. They were grouped by subject and “crammed” into tall cases. It must have been an amazing sight! Now here’s where things get mighty peculiar. Recently a mysterious document that appears to date back to the fire of 1877 was found crumpled under one of the old models. The document cryptically refers to “Cabinet No. 1171706,” which is otherwise unreferenced in any extant maps or records of the model halls. I’ve hit a wall trying to decipher its meaning, so I’m turning to you, my intrepid readers, to help in the investigation of the artifact (see images, above). Please post a comment if you have a theory or discover anything interesting: who might the initials in the document refer to? What could possibly be housed within a “Cabinet of Curiosities”? What is the meaning of the dire message scrawled at the bottom of the document? If you plan to attend our participatory session on Friday (Session 7C), bring a laptop and your knowledge of how to find old patents and historical documents—and help us rewrite (and remake) history! I’m having a hard time containing my excitement as I write this, and in fact am feeling a little breathless as I try to present a coherent account of my situation. My name is Colette Gravure. I live in Frederick, Maryland, where I own and operate a small used bookstore. Several weeks ago, while cleaning out my attic, I came across an unusual artifact stored among my Great Grandmother’s possessions. Composed of an odd assortment of coils, springs, gears, and other mechanical parts, it looks like rubbish–the kind of century’s old rubbish one only finds in moldy cellars and dusty attics. Since Great Grandma Milly was known to hoard all manner of trinkets and other bric-a-brac, my first impulse was to throw it away. Upon closer inspection, however, I was surprised to see what appeared to be a typewriter or telegraph key. A yellowed label attached to the object–still partially legible–likewise piqued my curiosity. I became convinced that I had found something of note–perhaps an antiquated writing machine. Now here’s the really eerie thing–the reason I have goosebumps: that label I mentioned? Inscribed in black ink in what looks to be a female hand are the words “Cabinet No. 1171706.” A Google search brought up your blog post, and so here we are. here for your consideration. Given the remarkable sequence of events that has brought us here, I wonder if you would be amenable to my leaving the object in your care in hopes of further discoveries. Do let me know when you’re available to discuss such an arrangement. I can be reached at colettegravure@gmail.com. Here’s What Jenny Emanuel Has To Say! 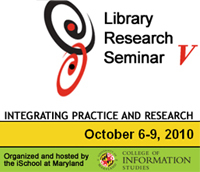 This site supports coverage of the Library Research Seminar V, 2010 and is the product of efforts by recipients of IMLS-sponsored fellowships to participate in the event. In advance of the conference, speakers are asked to provide insights into their research and presentations. During the conference, Fellows will blog from sessions and post reflections on programs.